An excellent product for people who suffer fro candida albicans. Digestive System: Indigestion, pain and gas, abdominal bloating, heartburn, diarrhea, constipation, gastritis, mucus in the stool. Urinal / Vaginal System: Menstrual cramping, cystitis, vaginal itching or burning, recurrent bludder infections, burning or urgent urination. Nervs System: Anxiety, depression. luck of concentration, sudden mood swings, headaches, drowsiness, poor memory, fatigue, insomnia, lightheadedness. Mouth and Throat: Bleeding gums, dry mouth and tongue, cracked tongue, white patches, thrush. Muscular Skeletal System: Muscle and/or joint pain or swelling. Dose: 1 oz (2 tablespoons) mixed with 2 oz of water, daily on an empty stomach for 2 month. Maintenance: 1 table spoon per day as above. Children: 1 table spoon daily mixed with water for 30 days. Candida Selecta is a treatment of choice for the treatment of Candida related disorders. 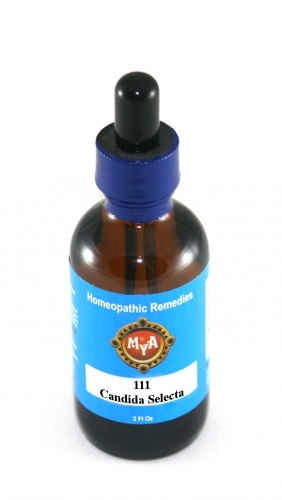 This Homeopathic Remedy is processed in the homeopathic tradition and with the philosophy of treating the like with the like. While Candida is present, do not use corticosteroids or oral contraceptives. Avoid cheeses, alcohol, chocolate, dried fruits, fermented foods, all grains containing gluten such as wheat, oats, rye and barley, ham, honey, nut butters, pickles, raw mushrooms, soy sauce, sprouts, sugars in all forms, vinegar and all yeast products. Eliminate all citrus foods from your diet for one month, then eat them sparingly because fruits are alkaline forming and Candida thrives on them. Your diet should be fruit free, sugar free, and yeast free. Your diet should be low in carbohydrates, high in vegetables and meat, brown rice, millet and acidophilus. Avoid chemical household products and cleaners, chlorinated water, moth balls, synthetic textiles and damp places such as basements.